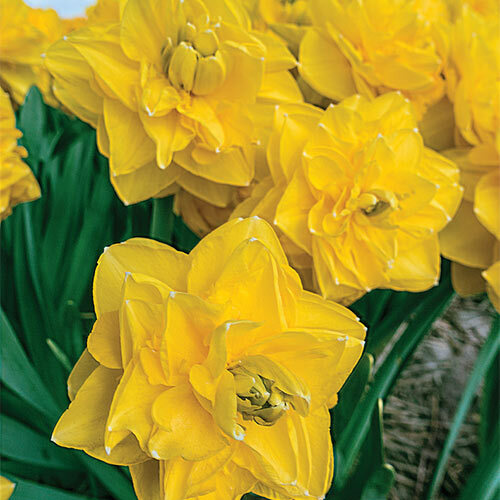 The fluffy, vivid golden-yellow flowers of Grandiosa are perfectly shaped for a perfectly wonderful garden display. Each fully double bloom bears layer upon layer of soft petals that illuminate beds, borders and container gardens with bright, bold color and gorgeous flower form. It is perfect for adding pizzazz to cut-flower bouquets and fresh floral arrangements. Also makes an outstanding addition to the landscape in the form of a brilliant focal point planting. A vigorous grower, it also exhibits exceptional performance in southern zones, too. Grandiosa is a good naturalizer and reliably reappears each year with even more blooms and improved beauty. Large, 4-4.5", fully double flowers.